* Swiss saxophonist Christoph Erb has recorded more than a few records with Fred Lonberg-Holm and drummer Michael Zerang, so this is a meeting of minds that are comfortable working together in creatively improvised directions. 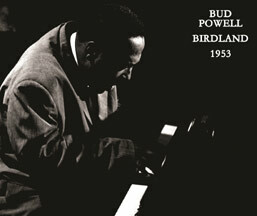 The first track, “Corolla,” introduces the trio’s mastery over various extended techniques and integrated playing. Lonberg-Holm has been exploring electronic processing for a while now, transforming his bowed cello notes into trebly squeaks and whines, undermining the cello’s natural fullness of tone. 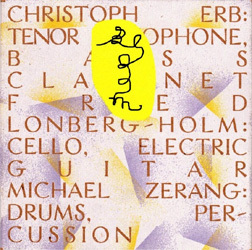 At times the three musicians seem to purposely confounding the listener, oh if that sound is the cello, than that drone must be a bowed cymbal... Only late into this first long piece that Zerang starts playing what could be called jazz rhythms, and Erb starts playing the saxophone in line with those vibrant rhythms. 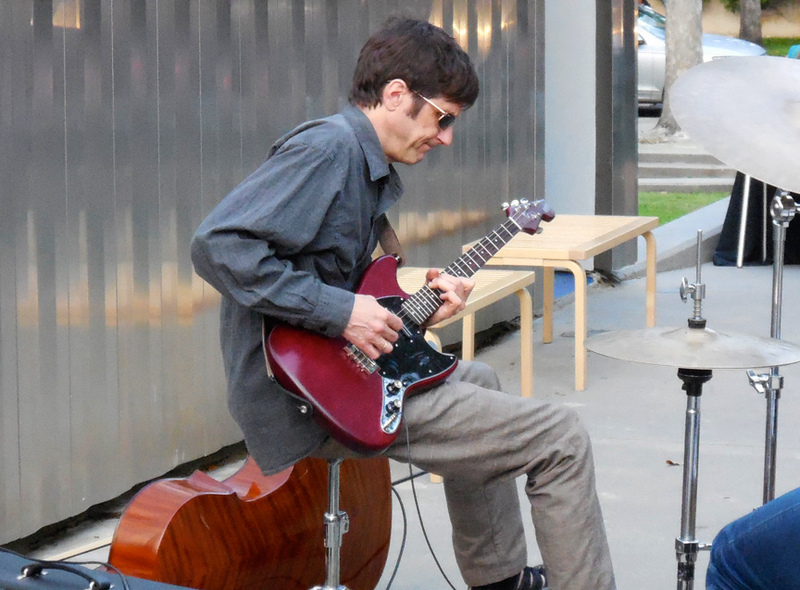 The second piece, “Perigon,” forms around Lonberg-Holm’s delicate guitar playing. I’ve noticed that he seems to be happy to keep his string sounds in the background but soon, the saxophone and drums take front stage with energetic, rolling improvisations. But then processed guitar sounds erupt all over the place. This music warbles and crackles in many different directions. The record ends with “Calyx,”—these titles are all names of flower parts—which flows from wailing into everyone playing abstract rattling sounds. An excellent trio performance of adventure. A nice reissue of a rare 1977 LP from long time Sun Ra multi-instrumentalist (and maybe multi-mentalist) Pat Patrick, who was a member of Ra’s groups from 1954 until Ra’s death in 1991. Sun Ra’s bands could obviously do very weird things, but were also well-versed in classic big band playing, and this is the groove that Patrick leads his band of well-seasoned players into. The gimmick of the band is the seven baritone saxophonists, three of them doubling on flute, but it does not come across as a gimmick. When I listened to the record before knowing who was playing on it, I thought it was a typical big band line up. Charles Davis is the only other player in the group who comes from Ra’s many bands (with the admission that it is probably impossible to be completely accurate about this); Mario Rivera played with Tito Puente for years, James Ware appears on a few 1970s Archie Shepp records, George Borrow played with Mingus in the 1950s, and it is probably Mingus’ larger ensembles this music reminds me of most, especially the upbeat “Uptightedness.” Pianist Hilton Ruiz anchors the band throughout with bouncy comping, adding to the group as if it was recorded in 1957, not 1977. 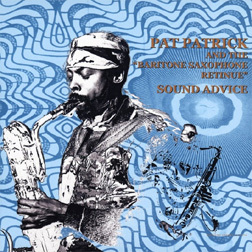 We are given one Sun Ra tune, “East of Uz,” that blends in with the general sound of Patrick’s tunes. This isn’t weird music, or very out, but very enjoyable large ensemble jazz, sounding like everyone is playing off charts. It is a live recording and at times you can hear the bass drum isn’t properly miced, sounding like an out-of-place thumping, and that is a shame with all the superb playing featured here. One of the wonderful things about the Ex’s long career is their explorations and collaborations with musicians from both jazz and African music. 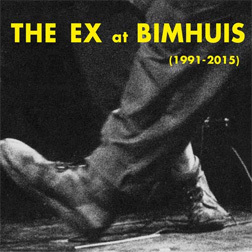 This set collects many of these collaborations performed live at the jazz venue Bimhuis in Amsterdam. We move through twenty-five years with the guest musicians from their Instant record—Wolter Wierbos, Ab Baars, Han Bennink—members of the Dog Faced Hermans, including Andy Moore who would later join the Ex as second guitarist, to the large scale Ex Orkest, including John Butcher, Phil Minton and many others, to shows with Brass Unbound, featuring Ken Vandermark, Mats Gustafsson, Peter Evans and Baars, and an expanded group backing Ethiopian saxophonist Getatchew Mekuria. These diverse activities all point to a punk aesthetic that is open-minded and adventurous, completely different from the insular, fashion-dominated ignorance of the American punk music I was first exposed to. For a long time, up until I first heard the Ex and the Swell Maps, in fact, punk had little interest to me. It seemed simple and stupid. But not this music. Throughout, this is powerful and interesting. If you’ve never listened to the Ex before, this would make a perfect introduction, excellent and exciting through and through, with the caveat that there is much to the Ex not in this compilation. And with Getatchew Mekuria’s passing earlier in 2016, this is also a nice memorial to his years of creativity. Make sure you are familiar with Mekuria’s work, now easy to find on many of the Ethiopiques series of reissues. Like the other parts of my record collection, the jazz section mostly contains the numerous works of a few particular people. This smartly-produced compilation wonderfully exposes me to works of artists I know somewhat, but usually as sidemen on others’ records, Grachan Moncur III, Joe Henderson, Richard Davis, and some artists whose names I don’t recognize, including Tyrone Washington, Doug Hammond, Lloyd NcNeill. 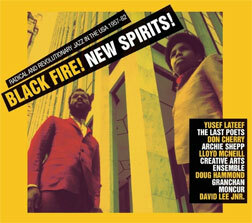 In fact, the only piece on the compilation that was in my collection is the Archie Shepp crypto-dramatic work with Jeanne Lee, “Blasé.” Subtitled “Radical and Revolutionary Jazz in the USA 1957-82,” these fourteen tracks show some of the numerous ways Black American musicians expanded and exploded the horizons of jazz, exploring transfusions of soul and funk music and various ethnic inspirations. This is not the most Out collection, except maybe the Tyrone Washington collage of a few different ensembles playing at once, “Universal Spiritual Revolt.” Most of the music here possess a definite and enjoyable groove and not the free jazz fire I am more familiar with. It’s a friendly introduction to jazz, maybe for people who think they would be bored by inside material, or scared off by the shrieking catharsis of free jazz. The short track by the Last Poets is more funk than jazz to my ears, and Don Cherry’s 1973 “Utopia and Visions” slowly unfolds with rolling piano and soaring flute like a piece by Alice Coltrane, whose presence is lacking on this collection. Not that I would cut anyone from this collection; a second volume would be eagerly appreciated. 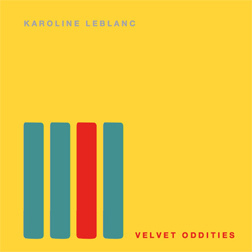 * A pianist and multi-instrumentalist in the Total Improvisation Troop ,a very large Canadian collective, Leblanc sits alone, spinning out nineteen short pieces on acoustic piano. The pieces defy categorization, sometimes resembling the works of Eric Statie, sometimes the work of Bill Evans, sometimes Philip Corner, but I assume all of these works are improvised, having the tenacity to veer off into interesting little tangents in a pleasing inquisitive manner. A few pieces explore keyboard mania, seemingly playing at top speed. * This trio of noisemakers is “bad” only in the sense that if you were expecting any kind of jazz this side of AMM, you’d be disappointed. Instrument maker Bryan Day joins forces with with Ben Salomon and Tania Chen to combine Day’s unique instruments with electronics, piano and sometimes accordion. When the piano enters in “Polonaise,” [Chopin composed many pieces called Polonaise which I generally enjoy, but I am concerned the word might refer to a type of exceptionally gross Polish mayonnaise that forced Chopin to flee to Paris—I’ve not yet read a detailed biography of him. -Ed.] you may think for a moment you are listening to AMM. Chen has performed works by Cage and Cardew before, so she displays an interesting sense of timing. Quiet feedback whines, bumpy percussion and metal sounds meld with the keyboard instruments into interesting, tactile music that constantly surprises. Bad jazz but great music. I know Mitchell through her flute playing in the ensembles of Anthony Braxton and Dave Boykin, and if I still lived in Chicago, I’m sure I would be more familiar with her. The large ensemble pieces on Intergalactic Beings owe much to Braxton’s inclusive-by-collage creativity, especially during the times when it seems the performers—including Boykin, Josh Abrams and Jeff Parker—are playing different pieces concurrently. 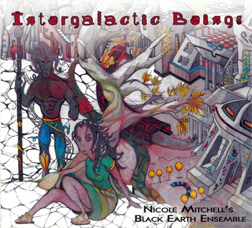 I don’t think you could confuse her work for Braxton’s; Mitchell displays both a more playful and funkier touch here, even though, like Braxton, the music recalls more Bela Bartok and Charles Ives than it does Sun Ra or Miles Davis’ electric groups. This is most evident in her inclusion of Mankwe Ndosi’s vocals that are much more emotive performance poetry than Braxton’s typical surreal armchair verbosity. 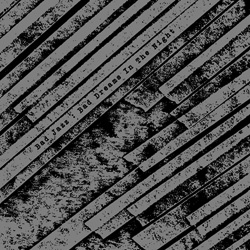 The creative pieces here flow through many different forms, dense multi-rhythmic jams to quiet drones and solo and duo passages that seem to generate their own sonic enclaves in the middle of a piece. In “The Inevitable” we hear a mad circus waltz beat that gets eclipsed by a mass of percussion. If you like creative, large ensemble playing, do not overlook this fun, complex record.